Take off his hat, and hold out his arm, could I have this dance, m’am? This is the pop/folk version of the noted Blues bassist and vocal star. Danny Greenspoon produced a collection of great tunes, some of Suzie’s and some surprising versions of tunes from Led Zeppelin to Roy Forbes. I may weld the door to my CD player shut and put this puppy on continuous play. Congratulations to everyone involved-it’s a beaut! Vinnick quickly won the crowd over with her big blues-trained voice and a couple nods to the gods of rock, including a playful bossa nova arrangement of Led Zeppelin’s Rock N Rolls and an acoustic version of AC/DC’s Ride On. The crowd sang along and kept her out on stage for an encore. “It was a pretty wonderful introduction to Sarnia,” she said. Vinnick started out singing blues in Saskatoon and then moved to Ottawa in the early 1990s to join Tony D and his Cool Band, contributing vocals and bass to its 1992 award-winning release Dig Deep. After a couple years she went solo, selling 6,000 copies of her first compact disc Angel In the Sidelines. She has played folk festivals, toured overseas to sing for the Canadian troops and was one of nine singers (alongside Sarnia’s Emm Gryner) chosen to perform at a Joni Mitchell tribute concert at Toronto’s Harbourfront. Soon after her Sarnia show, Vinnick released her second CD 33 Stars, recorded with Danny Greenspoon, a producer who has worked with Great Big Sea and Spirit of the West. It’s a less bluesy collection of songs, the best of which are the five titles where Vinnick is listed as co-writer. They’re gentle-sounding, well-crafted, personal songs from the folk-pop neighborhood of Shawn Colvin and Rickie Lee Jones. Both are artists Vinnick admires. The title song 33 Stars and Drive Fast in particular are musical gems where Vinnick takes her big voice into a delicate space with style and tenderness. In Sarnia, Vinnick showed she has the vocal muscle to take over a rock stage. On her new album, she proves that she also has the ability to move into a gentle musical space and fill it up with the right amount of expression and feeling. A feeling of loss runs through the lyrics in Vinnick’s songs. “The past few years have been a bit of a challenge,” she said. Her seven-year marriage ended. Her grandmother and a friend died, and then both of her parents died of cancer. The song Hanging Out In Heaven was written for Vinnick’s father and the album’s country contribution I Need A Cowboy is a song she used to sing with him. 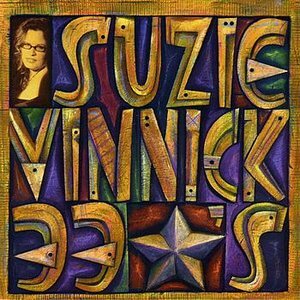 Her Latin-inspired version of Rock N Roll is there on the album, along with Tom Wait’s Picture In a Frame and a few other covers that show signs of Vinnick’s blues background. But, it’s the originals that stick out and stay in the mind of a listener. They’re good enough that the only reason Vinnick needs to think about recording covers is if they’re songs she really loves and wants to sing. It’s a well-built album, with some guest musicians including blues master Colin Linden on guitar and Quartette members Cindy Church and Gwen Swick on background vocals. A few major labels considered picking up the album but passed so Vinnick released it herself. “I think it’s a pretty scary time for the majors these days with all the music downloading that goes on.” She said. “they seem to be very cautious about who they sign. “I’m not the type of artist that will likely sell millions of albums and it seems they’re looking for really heavy hitters”. She’s too kind. Vinnick is another example that much of the truly good and interesting music being made today is found away from corporate music and the major labels. The accountants are running mainstream music these days, and running it into the ground as quickly as they have Enron and Qwest. So, music lovers have to go hunting for the good stuff, but albums like 33 Stars and artists like Vinnick make it worth the trouble.